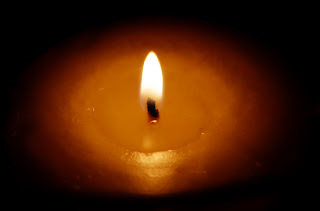 MUSIC: "A Candle in the Window"
I'm off to the big city today to accompany my husband on another doctor's appointm ent. I know there will be alot of hustle and bustle everywhere as Christmas shoppers seem to be wrapping up their lists earlier and earlier each year. As I enter the cancer clinic, it will once again make me very humble. There is always a full house of patients and those who accompany them. Despite their reason for being there, I always see smiling and friendly faces. Cancer makes all those affected very humble and allows us all to realize just what is important in life, especially at this time of year. It is not about expensive gifts, or who gives the best Christmas party. It's not about who has the best decorated house or who spends the most money this year....it's all about appreciating the simple things in life. Simple things are where your riches truly lie. All very simple you may say at first thought, but yet these are the gifts that no amount of money can ever buy. So, this is my candle in the window to remind me of the simple things this Christmas and my gratitude for many blessings throughout the past year. I hope you light a candle as well in appreciation of all that you may have!! !